There is a history of Barcelona rejects ending up on Rayo's doorstep. Born in Asteasu, Gipuzkoa, Julen Lopetegui started his professional career at local Real Sociedad, where he was barred by legendary Luis Arconada. In 1985, he accepted an offer from Real Madrid, who immediately incorporated the 19-year-old to its B-team. After a loan spell at Las Palmas (1988-89), Lopetegui returned, but could never dislodge another veteran, Francisco Buyo, only managing one La Liga appearance during two seasons, a 3-3 away draw against Atlético Madrid as Real was already crowned league champions. He subsequently signed with Logroñés, being instrumental as the modest Riojan club consistently managed to retain its top flight status. Lopetegui's stellar performances at Logroñés earned him his sole cap with Spain, coming on as a substitute for Andoni Zubizarreta for the final 30 minutes of a 0-2 friendly loss with Croatia in Valencia, in March 1994. He was subsequently picked for the squad at that year's FIFA World Cup. As Zubizarreta left for Valencia, Lopetegui joined Barcelona, battling - and losing - for first-choice status with longtime understudy Carles Busquets. After the Catalans bought Porto's Vítor Baía he was further demoted to third-string, and returned to Madrid with Rayo Vallecano, being a starter in two of his five seasons (although he still managed 36 league appearances from 1999 to 2002, with Rayo always in the top division, as he retired subsequently). After five seasons at Rayo, Julen retired in 2002 and became one of Spain coach Juan Santisteban's assistants at the European Under-17 Championship. After the tournament, he was appointed Rayo's coach, but was sacked after 10 matches during a tumultuous 2003-04 Segunda campaign which led to Rayo's second relegation in two years (about which I've written before, read it here). He would leave managing for a while to work as a commentator, but then in 2008 he took over at Real Madrid B for a season. From 2010 to 2014, Lopetegui worked with the Spanish youth teams, winning the 2012 European Under-19 Championship and the 2013 Under-21 Championship. He left the Royal Spanish Football Federation in April 2014, following the expiration of his contract; he would then take over at Porto, where he guided them to the quarters of the 2014-15 Champions League, but lack of silverware meant that he was fired in January, 2016. Since July 2016, he has been coaching the Spanish national football team. Pablo Sanz was born in Barcelona, was a technically astute central midfielder and was a La Masia graduate - in other words, he was Barcelona through and through. He would spend three seasons at Barcelona B in the Segunda between 1994-97, along with a loan spell at Segunda B side Gimnàstic (1994-95), but never broke into the first team. Pablo Sanz took over the Rayo Vallecano midfield for seven seasons (1997-04) and coincided with Julen as player and coach. 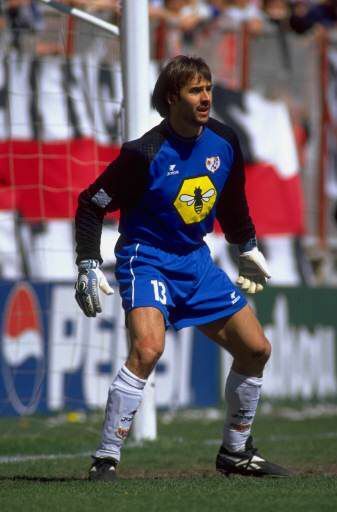 He participated in the promotion of 1998-99 and in the relegations to the Segunda and Segunda B in 2003 and 2004. But his relegation streak wasn't over - he would play a further season at La Liga side Numancia and another at Segunda B side Sabadell. Both ended in relegation too. He would subsequently retire, and began his managerial career at Castelldefels, moving on to Cornellà. He would then be chosen as the U-18 coach of Catalunya and Cruyff's number two with the national team (of Catalunya, that is), followed by being employed by the Costa Rica federation to supervise the lower league teams. He is now back with Julen, having been part of his staff at Porto and now Spain.